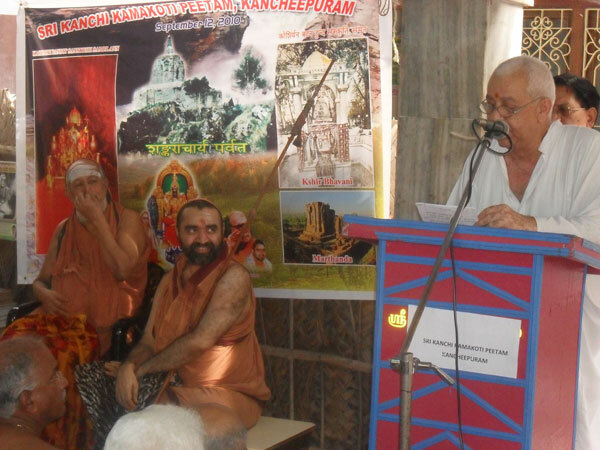 Pandit Omkarnath Shastri of Jammu & Kashmir, a well known Scholar of Hindu Scriptures presented the Kashmiri Panchang (Almanac) and Books on Religious practices followed in Kashmir to His Holiness Sri Jayendra Saraswathi Swamiji of Sri Kanchi Kamakoti Peetam at a Kashmiri Pandits Samskruti Sammelan held on 12th Sept 2010 at Kanchipuram. In his address Pandit Omkarnath Shastri traced the History of Kashmiri Shaivism and the various similarities between Kashmir and the rest of the Country in the preparation of the Panchang. He said that Rituals of Kashmir contained in “Karmakand” emanated from the South of India and were adopted by the people of Kashmir subsequently. His Holiness Sri Jayendra Saraswathi Shankaracharya Swamiji honoured the Pandit and appreciated his efforts.His Holiness also offered all support to foster Sanskrit and Cultural Education. 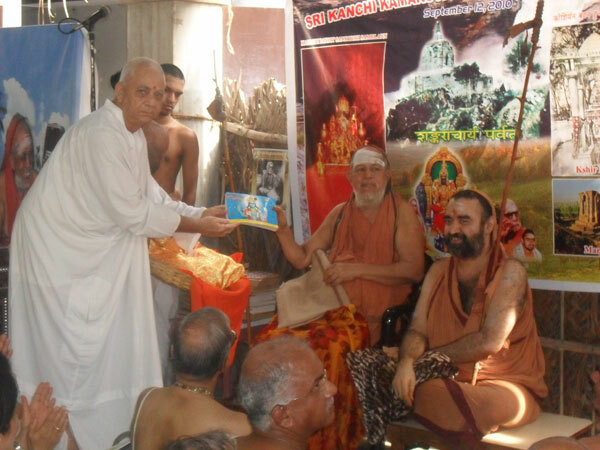 His Holiness Sri Vijayendra Saraswathi Shankaracharya Swamiji was also present in the function. His Holiness felt that the Panchang, the guiding Calendar, will also connect the various Kashmiri Pandits located in different parts of the Country and the Globe aside from explaining the essence of Dharma Shastras. Some of the Kashmiri Pandits who took part in the event include Mr Shashi Shekhar Toshkani, Author of Books on Cultural Heritage and Rituals of Kashmiris, Shri Moti Kaul President All India Kashmir Pandit Association, Mr. Raina President of Bangalore Pandit Association and Mr Susheel Pandit Publisher of “Praznath” a tri monthly Journal. Apart from them, several other distinguished Dignitaries from all over the country of different walks of life participated in the function. Pandit Omkarnath Shastri Editor & Publisher of the “Vijayeshwara Panchang” administers the Pandit Premnath Shastri Sanskruthi Shoda Sanasthan engaged in Kashmiri Cultural Studies. Since 326 years the family of Pandit Omkarnath Shastri has been publishing the Panchang in Kashmir. The Books presented by him to Their Holinesses included the Vijayeshwara Panchang,Hum Aur Hamara Sanskar,Kharma khand Deepak,Panchasthari,Vijayeshwara Nithya Niyama Vidhi, NavagruhaPooja, Praksh, Sahasranamavalis (Bhavani,ganesh,Jwalamukhi,Shiva,Surya,Vishnu,Sharada), Jagatdera Bhatt ke Milap,Bahurupa Garba, Mahimna Stotra, Rama Geetha and Jathakarma.The Books explain in clear detail Kashmiri traditions & rituals. 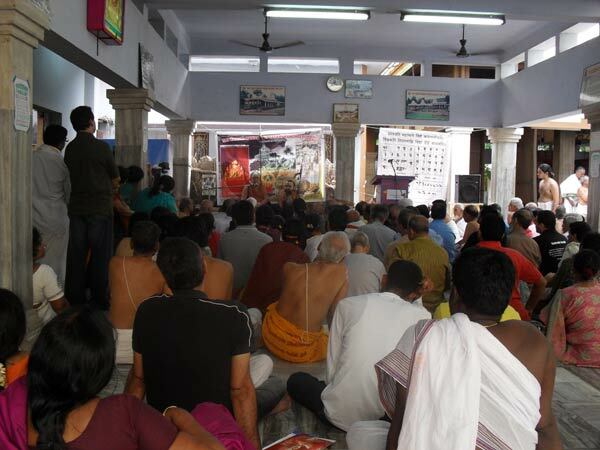 The function concluded with group singing of “Gauri Stuti” a hymn on Devi Bhavani written by Adi Guru Shankaracharya.